Bask in the quaint and luxurious charm of a delightful Whitefish MT Bed and Breakfast. Start the day with a delicious breakfast, pop in for late afternoon tea, discover local character and hospitality, and relax with the comforts of home in one of the nearby Whitefish Montana B&Bs. 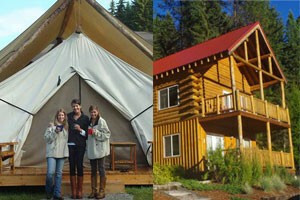 Bring the whole family and relax in a cozy B&B ranch suite, personal cabin or GLAMPING TENT. Wagon & sleigh rides, fishing, horseback riding & hiking and great food await you. Nestled in the forest of the Swan Mountain Range and minutes from Glacier National Park, we are open all year. Enjoy 4 wildlife-themed rooms gorgeously appointed. Just steps from downtown Whitefish, the Garden Wall features luxury linens and antiques furnishings in a charming 1920's house. Offering a mix of accommodation options from cozy cabins to a 5-bedroom lodge, the Haymoon Ranch Resort is situated on 20 stunning acres. Situated between Kalispell and Whitefish, Julie's Country Manor is just a short drive from Flathead Lake or Glacier National Park. Our 15-room Inn is quaint and relaxing with beautiful, unique furnishings featuring a king bed, queen bed or queen/twin combo in the room. Adjacent to the Whitefish River. A beautiful log-style home with 3 unique rooms, located outside of Kalispell. Guests enjoy wildlife viewing and hiking near Ashley Lake. Enjoy it all - sightseeing, birdwatching, skiing, boating, golfing. One magnificent suite on 15 scenic acres. Luxurious bedding, spa robes, down-filled sofas. Paradise! Dorm room beds from $30-$40/night. Comfortable and clean accommodations with sheets, towel, and comforter provided. Organic Juice/Smoothie/Salad Bar open to public, free Wifi. Select from one of our 4 luxury suites, all tailored to perfection. And if you love food, wait til you experience our Innkeeper's signature breakfast dishes.